Basit Shittu and JP Moraga in Pillowtalk. Photo by Walter Wlodarcyzk. BOTTOM LINE: Explorations of an interracial relationship through intimate verbal and physical conversations. 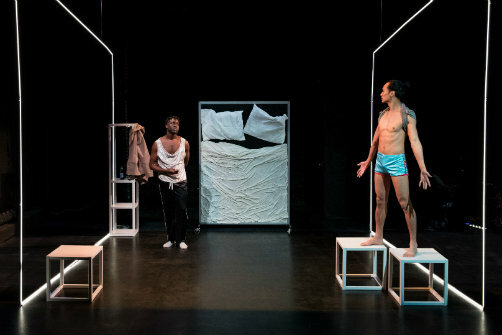 Perhaps because of the show’s graphic of its two performers in fluid movement, as well as the description ("a formal exploration of theatrical naturalism and the codified gender norms of ballet's pas de deux"), I had expected Pillowtalk to be mostly dance, with perhaps a few whispers. It is not. Rather, Pillowtalk is primarily a naturalistic two-hander with elements of dance to heighten the emotional charge. It explores the relationship between Buck (JP Moraga) and Sam (Basit Shittu), an interracial queer couple, as they navigate through a society that sets them up to be oppressed. It truly excites me that the protagonists are people of color. Here, the Asian and black newlyweds are undoubtedly in focus, rather than being the familiar “featured best friends” (see certain popular Netflix series). Buck is a journalist with integrity, freshly fired from his job, who must summon the courage to break the awful news to his husband. And that is Sam, a former competitive swimmer (at one time only Michael Phelps could beat him) with a history of substance abuse who now claims content with his nondescript job. In other words, a typical couple—constantly quibbling, getting riled up because their other half doesn't completely understand their point of view, and most importantly, remaining deeply in love. The play gets high points for being candid about its message. The characters, especially Buck, never shy away from saying exactly what they mean. The sexual, political, and racial minority experience is what we are looking at here, and there is no sugarcoating it. However, the play's script suffers from a lack of nuance as it turns pedantic with dialogue saturated with political buzzwords. Perhaps it makes sense for journalist Buck to be at ease with such a formal working vocabulary, but it also makes it difficult to sympathize with him. Shittu’s performance as Sam, the supportive husband and the more down-to-earth counterpart to the head-in-the-clouds Buck, is one thing that keeps the production engaging. There’s irresistible warmth of charisma in his deliverance that’s a delight to watch. The chemistry between Shittu and Moraga is also palpable and endearing at some of the play's stiller moments. The set, by Marie Yokoyama, is architectural and spartan, with a vertical bed for two so we can observe the actions from a bird’s-eye view, and also highly symmetrical, with each side accentuated by tubes of florescent lights framing the modest living space. While the bed isn't used much, the perspective works its magic when it is, with the pair "lying on it" by standing in front. But these moments are more a pause between rounds of dialogue rather than ones that carry dramatic significance. The dance duet at the end, which defies ballet's heteronormative tradition, is a testament to Pillowtalk. This queer pas de deux, which visualizes this couple's relationship in a physical way, seems to be a recap, rather than an extension, of the text we have just witnessed. There is a lot of strength and elegance in the silent, physical communication between the couple. Indeed the dance, choreographed by Katy Pyle, with Andrew Jordan’s luminous costumes and Lawrence Schober's sound design, is dreamlike and achingly beautiful. If only the script that came before could have matched it. Pillowtalk is written and directed by Kyoung H. Park. Music is by Helen Yee. Choreography is by Katy Pyle. Sound Design is by Lawrence Schober. Scenic and Lighting Design is by Marie Yokoyama. Costume Design is by Andrew Jordan. Dramaturgy is by Jess Applebaum. Assistant Direction is by Dana Greenfield. Stage Management is by Jamie Rose Bukowski. The cast is JP Moraga and Basit Shittu.